In September of 2017, AirGon LLC released Loki, a direct geopositioning system for the DJI Inspire 2 drone as well as generic drones carrying a digital single lens reflex (DSLR) camera. Since that time, Loki has been adapted to the Phantom 4 Pro and the m2xx series of DJI drones. A direct geopositioning system monitors the position of a drone to a high level of accuracy, synchronizes this position to camera events and records information that can be used, in a post-processing step, to provide a priori estimates of the camera location for each acquired image. The goal of a direct geopositioning system is to either reduce the amount of ground control needed to achieve a specific level of accuracy or, in some cases, to eliminate the need for ground control altogether. Thus, direct geopositioning can significantly improve both the accuracy and financial bottom line of projects. This report provides a bit of a feel for the accuracy of using Loki in an actual data collection scenario. In mid-November of 2017 we flew a limestone mine site with the goal of generating 1 foot topographic contours1 (“topo”) to be used for planning operations. For comparison, we have the good fortune of having 1 foot contours available that were produced in January of 2017 from high accuracy airborne topographic LIDAR. 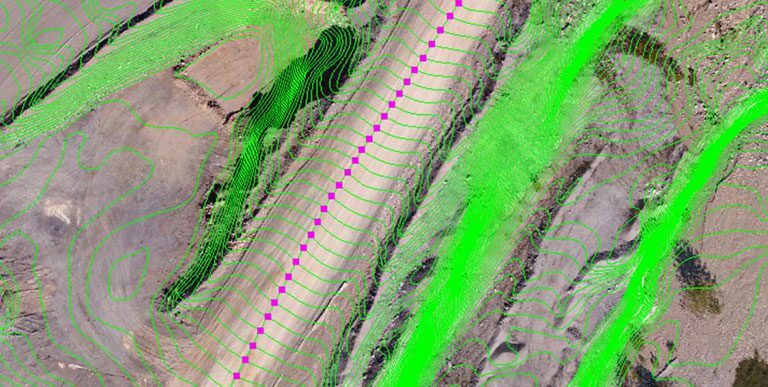 These data give us the opportunity to explore the vertical conformance of the drone derived point cloud in areas of undisturbed ground throughout the project.